Fill your home with the comforting blend of cedar, vetiver, and patchouli with the Parks Black Magic luxury scented candle. Made to exacting standards by our experienced perfumers, this luxury home fragrance candle provides strong, long-lasting scent for up to 80 hours ¬– so you can savour the fine fragrances of our natural extracts and ingredients. Our Black Magic candle celebrates the invigorating power of woody fragrances, capturing the revitalising notes of cedar, vetiver, sandalwood and clove in a potent blend of scents. From the balsam musk of vetiver, suggestive of earthy undergrowth and soil, to the calming, festive blend of orange and clove, this luxurious fragranced candle will fill your home with a complex scent that will set a relaxed and sophisticated ambience in any room. Mid notes of sweet, earthy cedar balance with fragrant top notes of vetiver, while sandalwood strengthens the bouquet with its creamy, woody scent. Finishing the blend comes a twist of orange and a pinch of clove, which together add spice and warmth to the medley. The resulting fragrance is sophisticated, refined and perfectly balanced, evoking the complex scents of nature in a blend of fine scents. 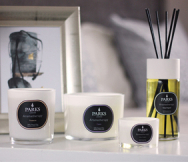 Our exclusive Black Magic collection marries the finest captivating and sultry fragrances, helping you set a sophisticated tone in any living space. Our Cedar, Vetiver & Patchouli 3 Wick Candle embodies the spirit of Black Magic, infusing your home with enchanting fragrance and wrapped up in an elegant, black presentation gift box ¬¬– for the perfect gift.